The Bichon Frise Flynn won Best in Show at the 2018 Westminster Dog Show. Revere Auctions’ New York correspondent was in the crowd at Madison Square Garden and witnessed the parade of handsomely coiffed dogs. The majority of the crowd (and the correspondent) was rooting for Bean, the charmingly goofy Sussex Spaniel. When the Bichon Frise was announced Best in Show, this correspondent’s expression was similar to that of the white dog in this painting attributed to William Osborne: skeptical, unenthused, unimpressed. Such is the skill of Irish painter William Osborne that he’s able to capture such complexity and realism in his animal subjects that we humans are able to see our own expressions in them. William Osborne (1823-1901) was the leading animal painter of his day, known for his handsome stallions, hounds and even lions and tigers from the Dublin Zoo. 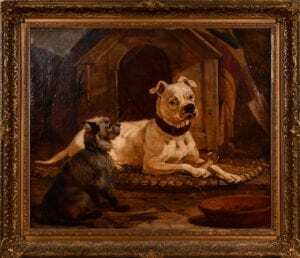 His mastery of depicting animal characteristics shines through in this late 19th Century painting depicting two dogs in the early stages of confrontation. The bone of contention in this scene is, well, the bone, which is guarded closely by the white dog and coveted by the terrier. The scene is a vibrant split second of an interaction which leaves the viewer to imagine the scene continuing. William Osborne is the father of the Walter Osborne, the esteemed Irish impressionist and Post-Impressionism landscape and portrait painter. This untitled oil painting attributed to William Osborne is in our March 24th auction. Dimensions 25 x 30 in., frame 32 x 37 in.